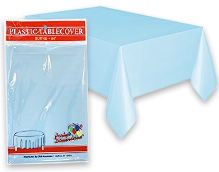 Tablecloths for Parties, Vinyl Tablecloth, Plastic Table Covers, & Party Tablecloths. Dress up a basic folding table or protect your furniture from the random spill or mess with a plastic vinyl table cover. Browse our wide selection of party table covers, plastic table covers, vinyl tablecloths, and party plastic table covers. They can be used either indoors or outdoors, whether you’re hosting a house party or an outdoor cookout, and make for simple and easy clean-up once the party’s all over. In addition to protecting your furniture and floors from accidental food spills, our assorted collection of vinyl or plastic table covers can be had in a variety of assorted shapes, dimensions, colors, and patterns. 108 inch round vinyl tablecloth or square and rectangular tablecloths. Pink tablecloth for parties, raffia or grass table skirts for luau parties or Polynesian barbecues, or choose your own favorite shade from a brilliant rainbow of colors. Create a monochromatic or multi-hue theme by dressing your tabletops with either the same color or go all out with different colors. Perfect for formal events, as well. Table edgings and wedding table skirts, banquet table skirts for the more conservative and restrained sort of party gathering. It’s party decor that also functions as protective furniture wrapping. Shop 1SuperParty for the best deals on discount party supplies, wholesale plastic vinyl table covers, table cloth skirting, and wholesale table skirts for your next party, birthday party, wedding party, outdoor cookout, or any jovial celebratory affair. Lot of 4 Unique Pink Plastic Tablecover 54" x 108"